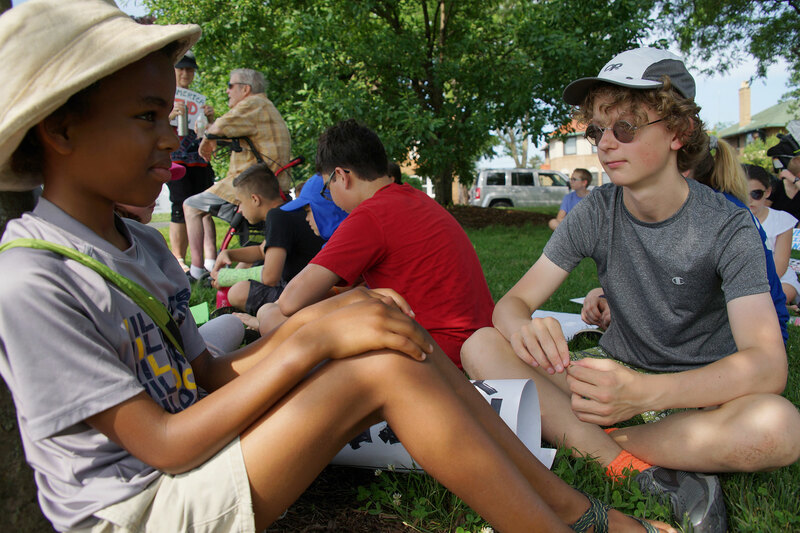 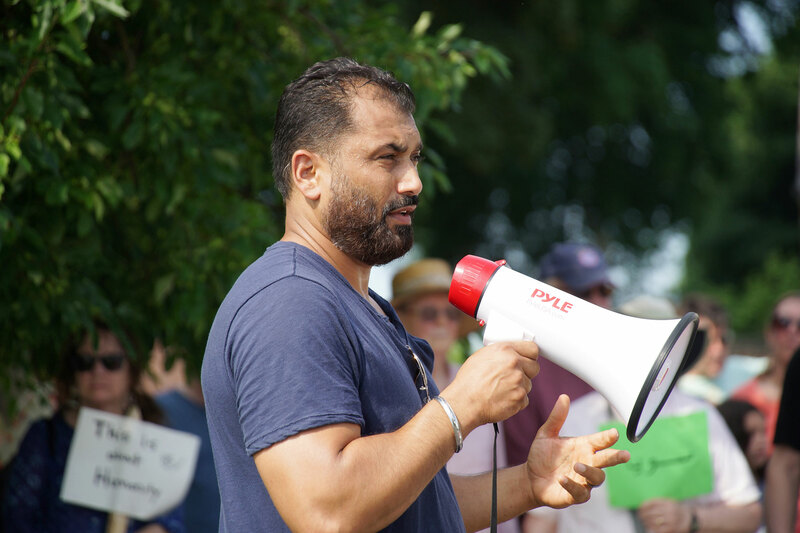 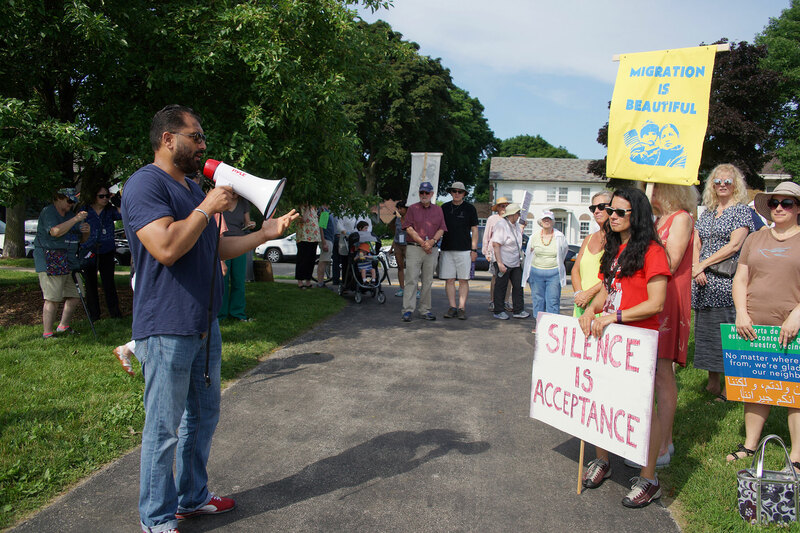 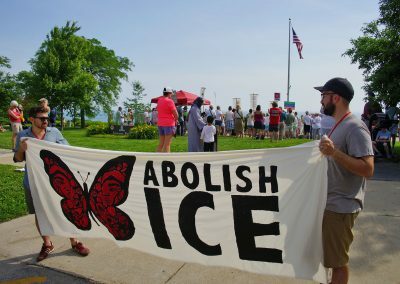 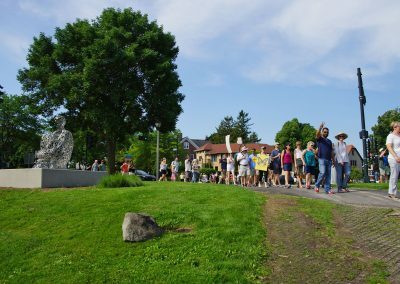 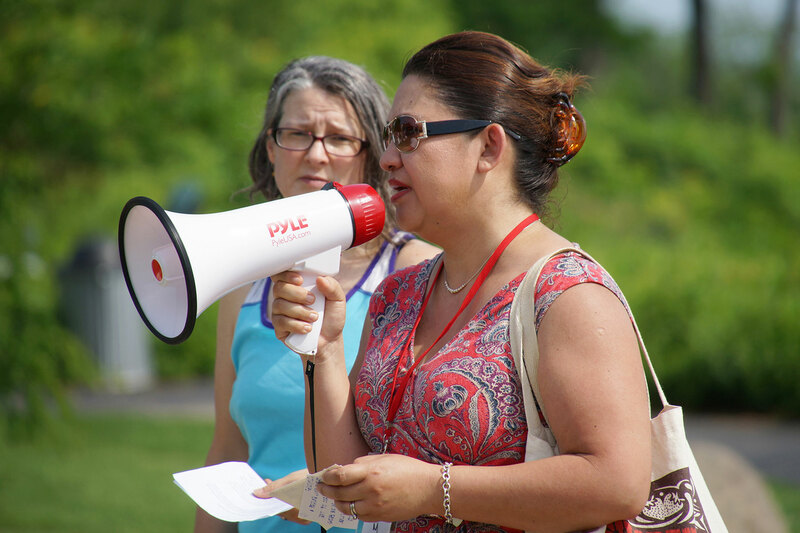 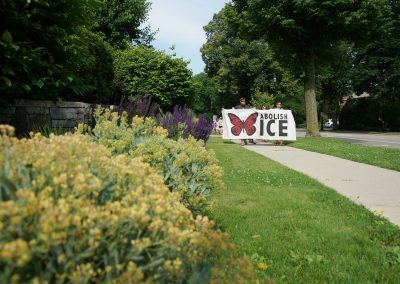 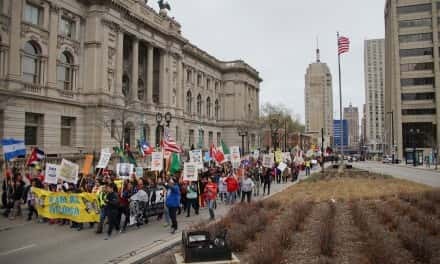 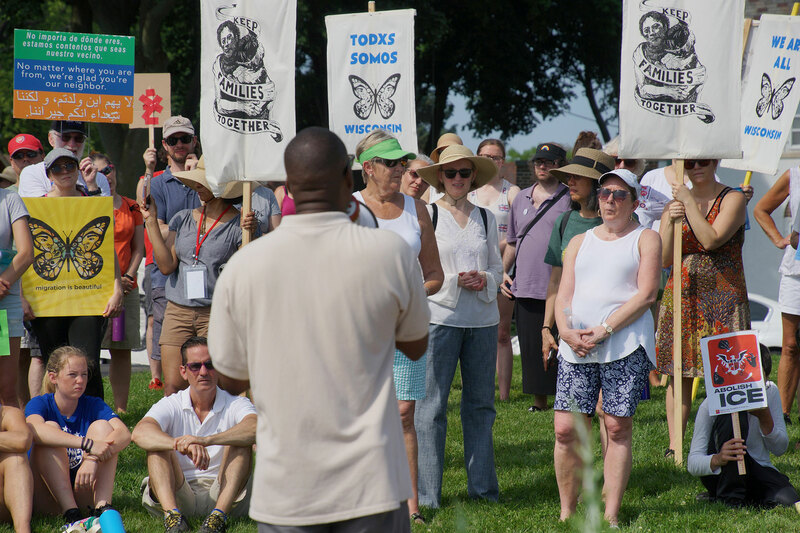 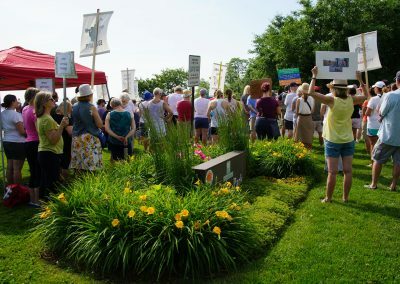 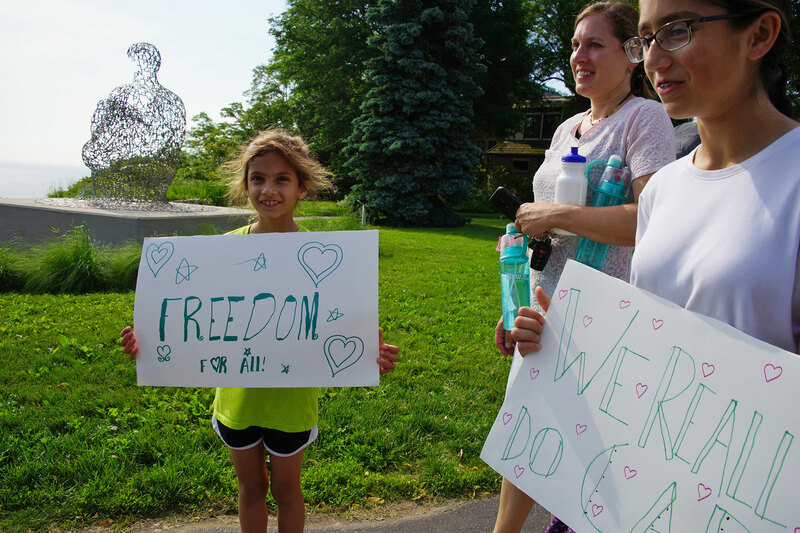 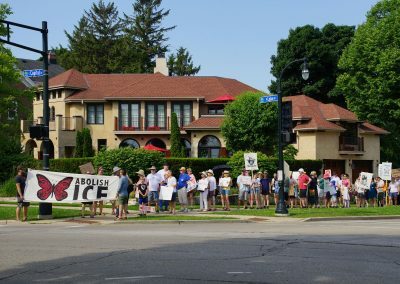 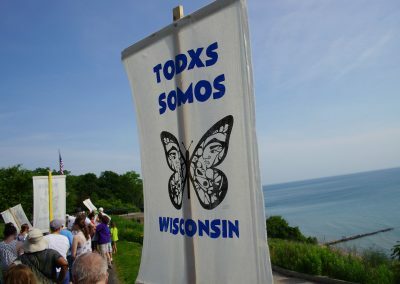 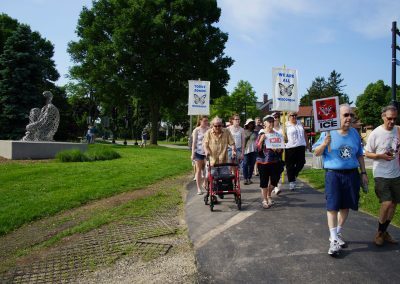 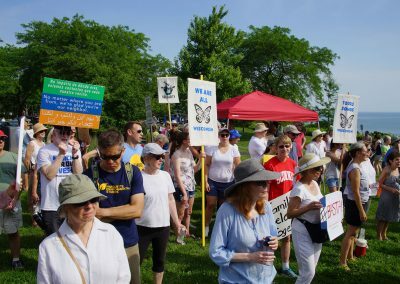 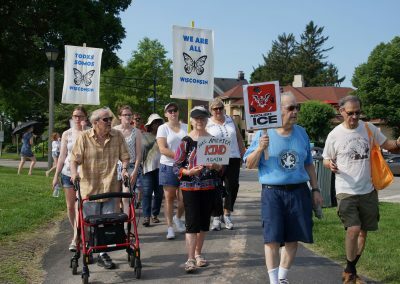 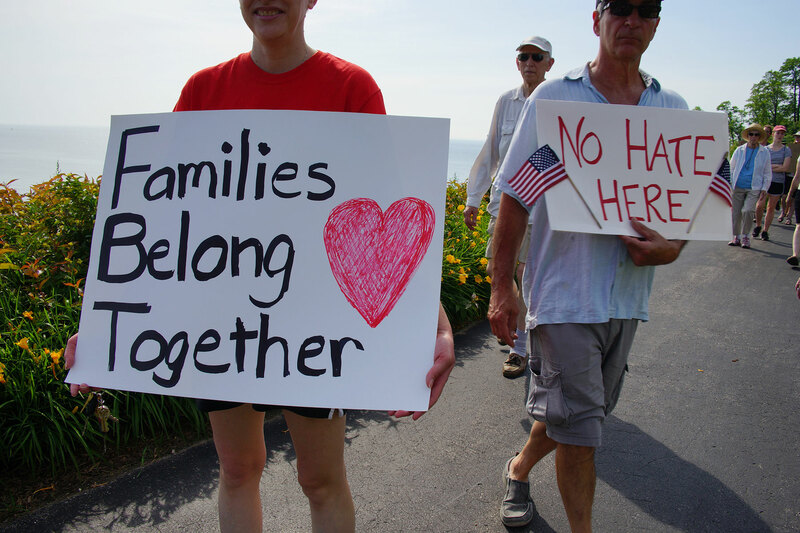 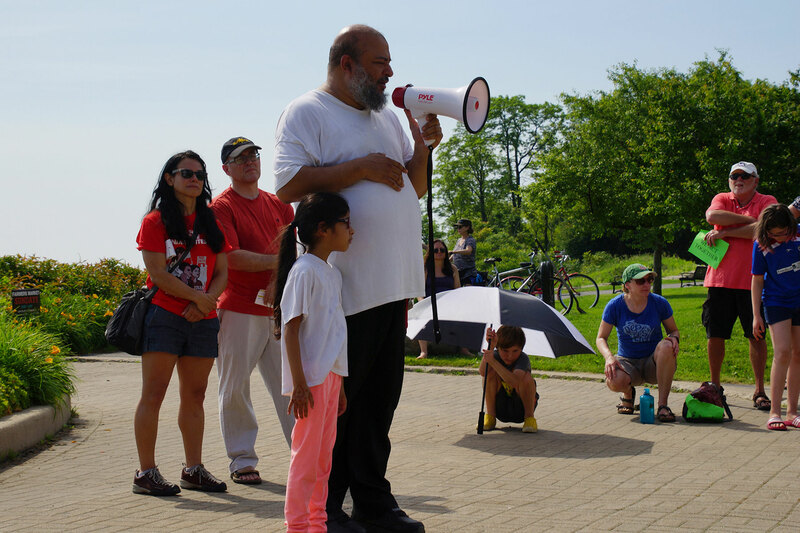 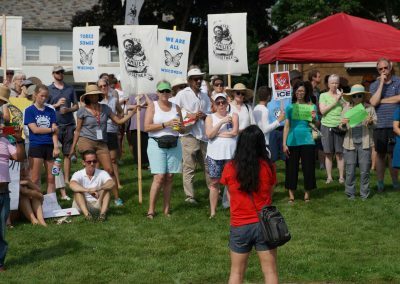 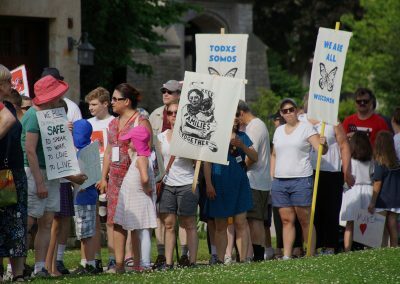 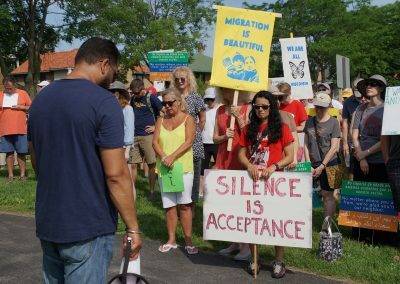 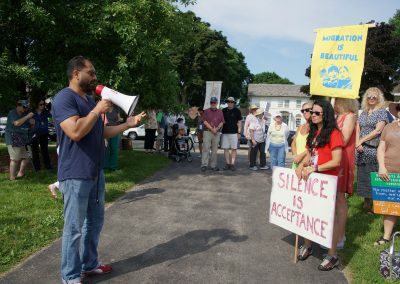 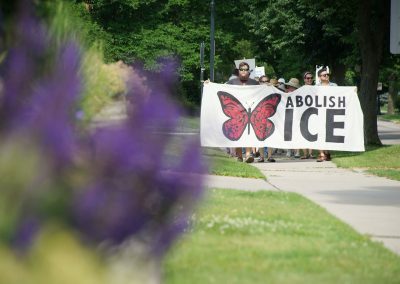 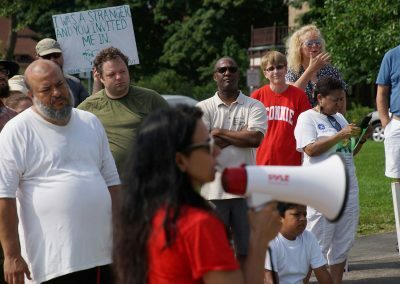 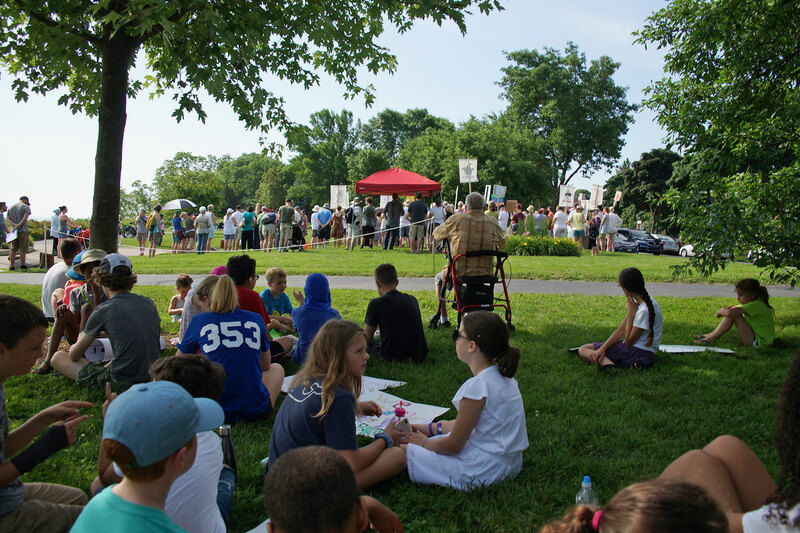 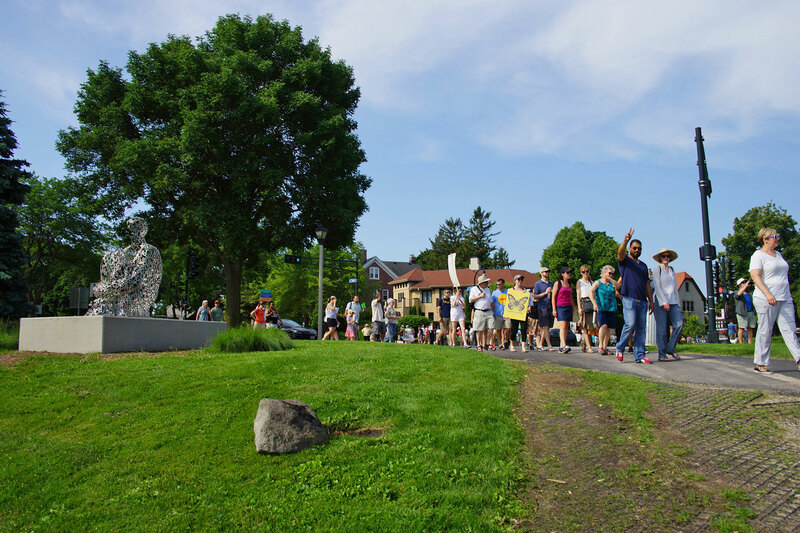 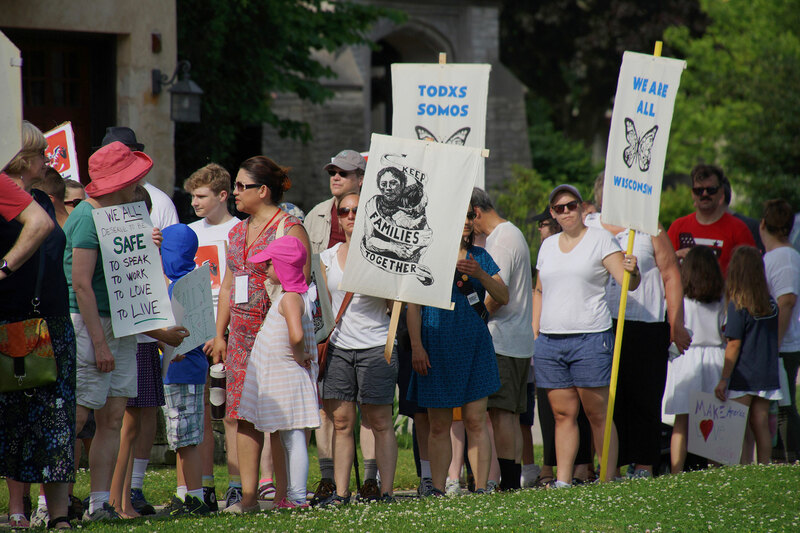 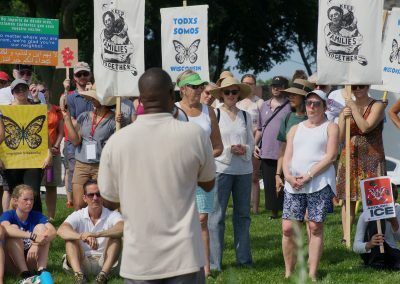 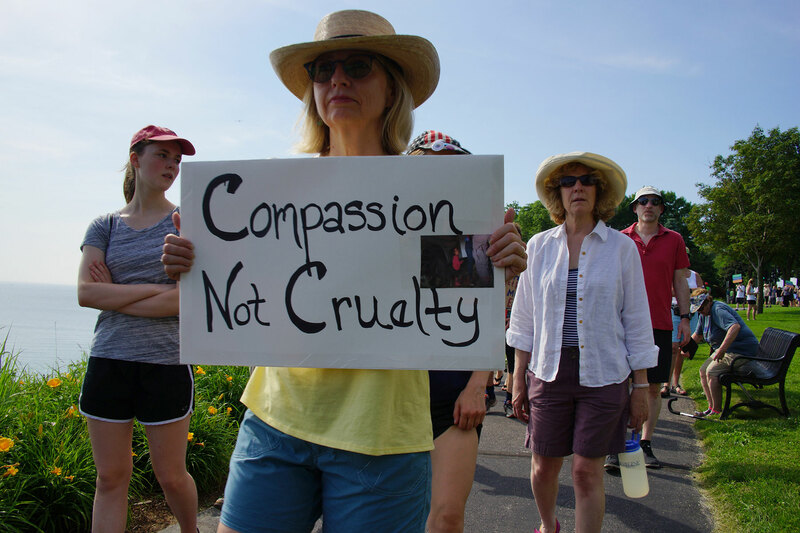 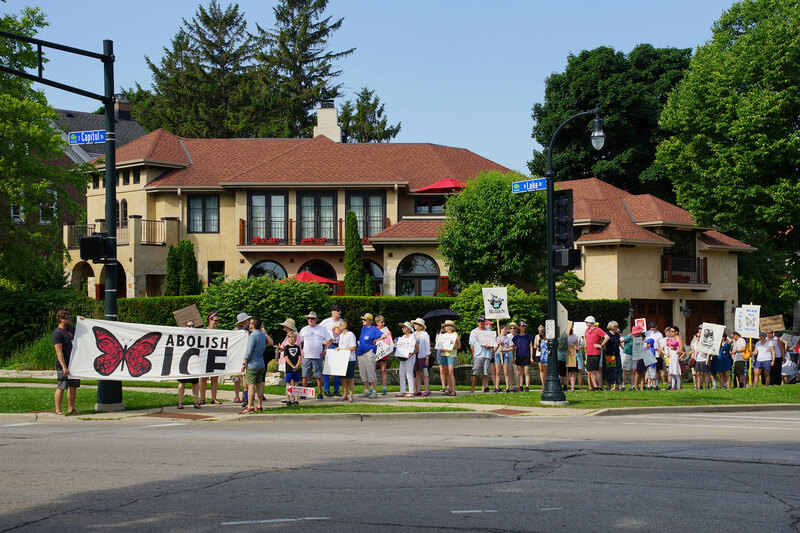 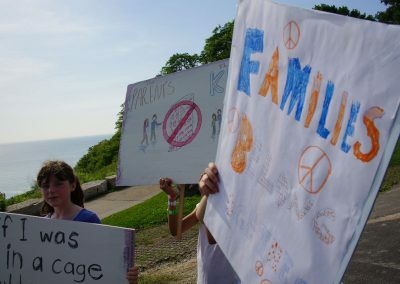 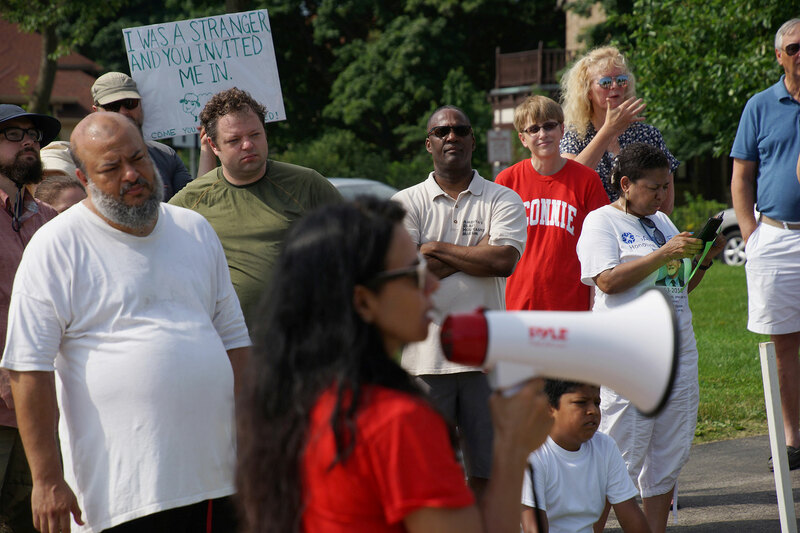 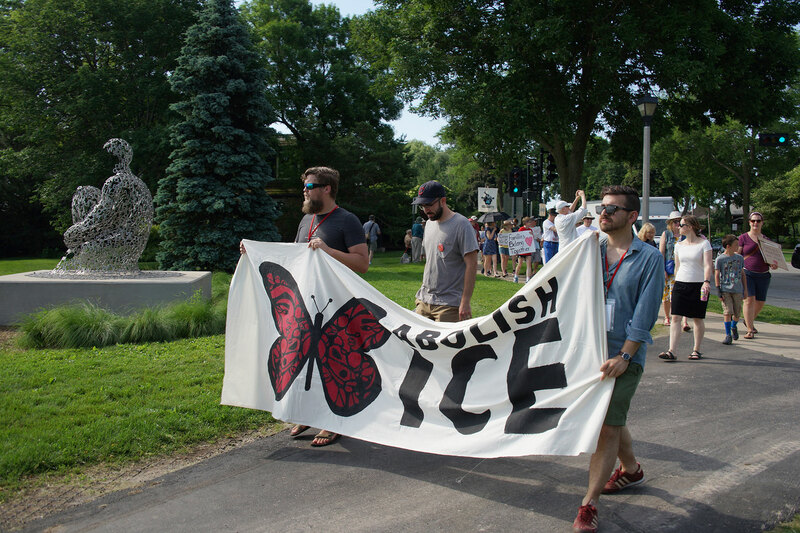 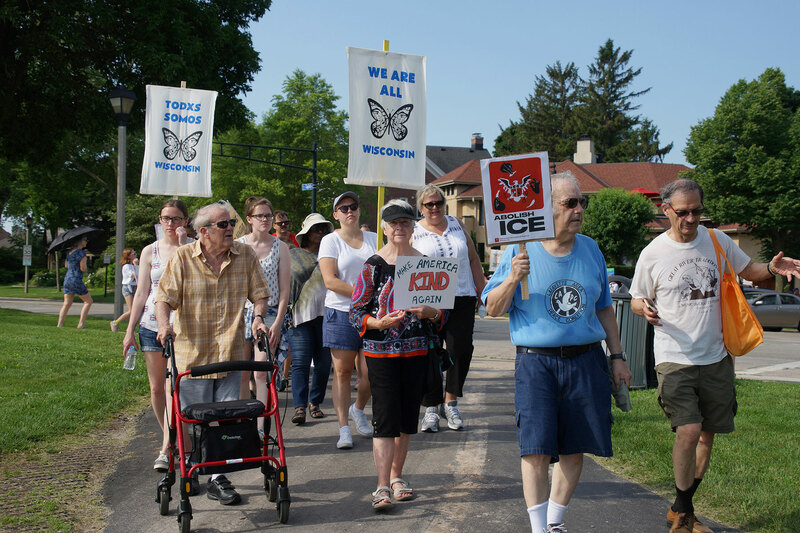 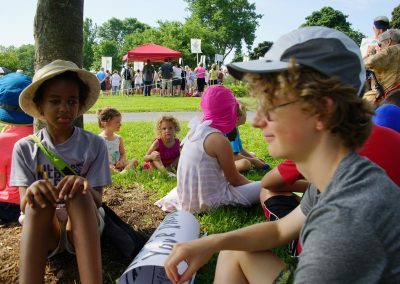 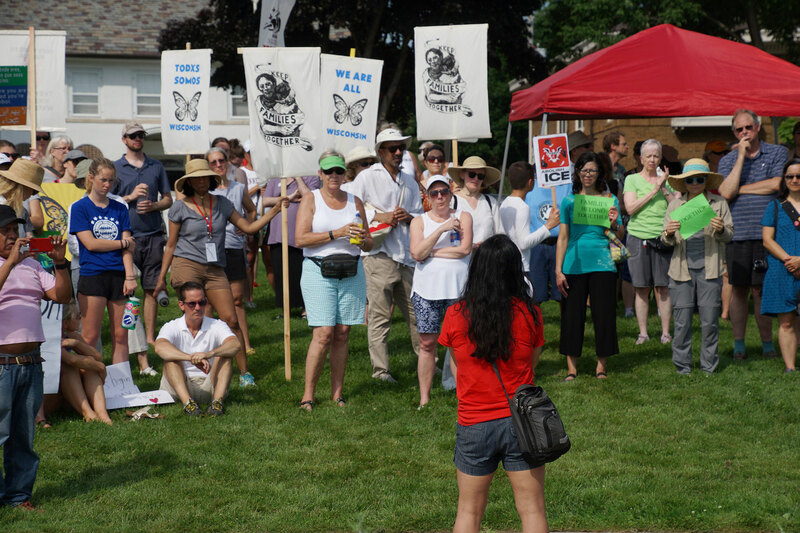 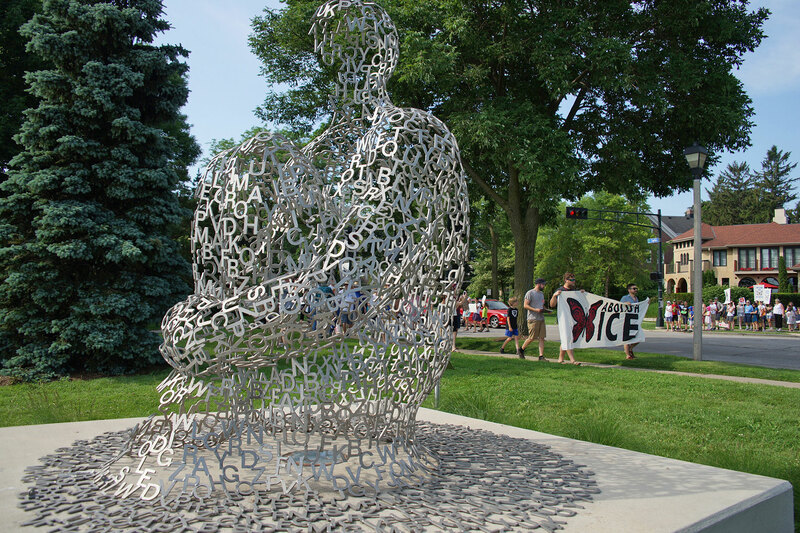 On June 30, the Shorewood Solidarity Network led “March for Humanity, Compassion & Action” as part of the nationwide “Families Belong Together” rallies, joining 600 other planned events that saw hundreds of thousands of people protest the ‘Zero Tolerance’ immigration policy of the Trump administration. 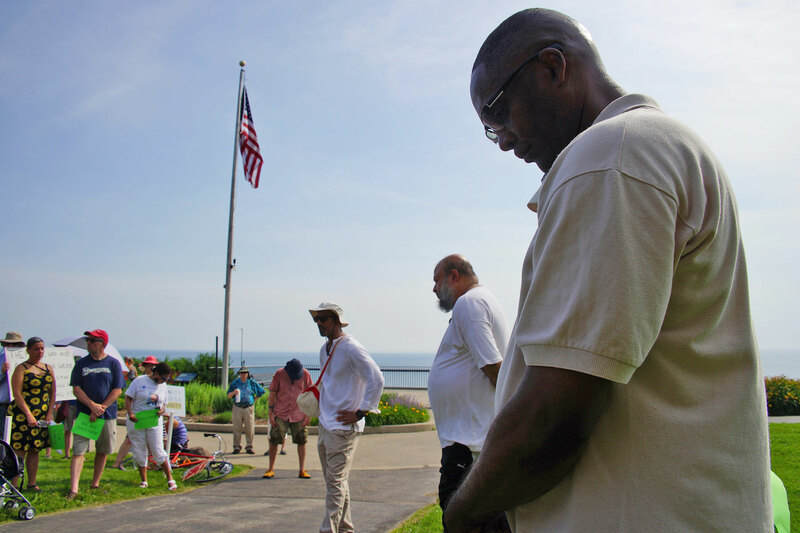 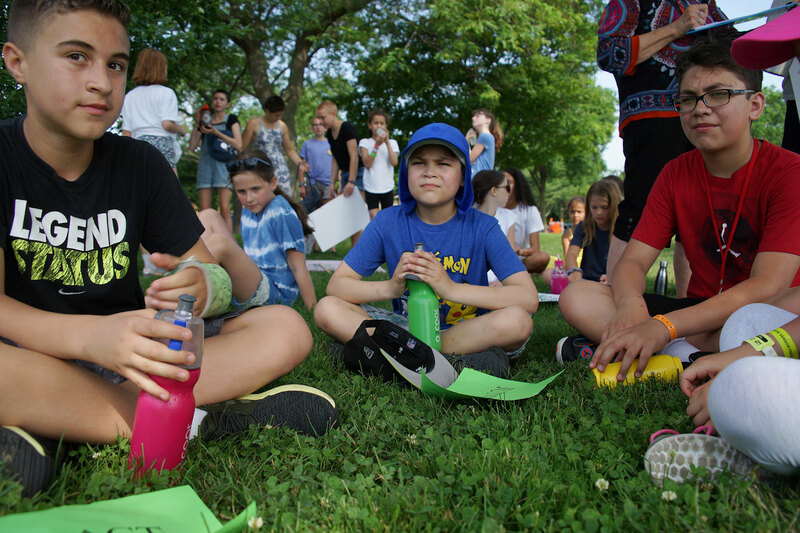 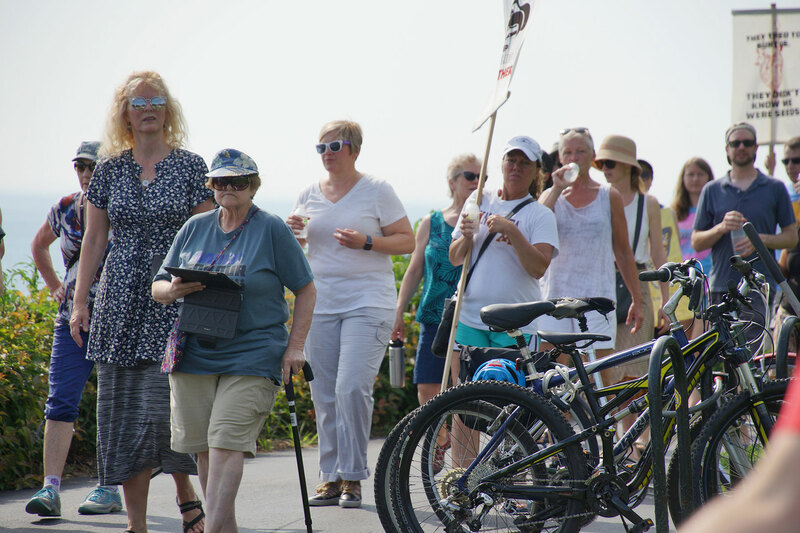 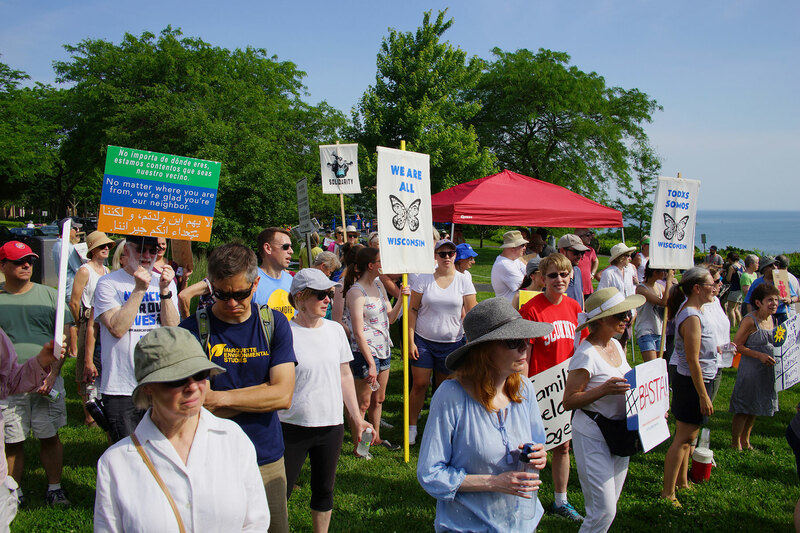 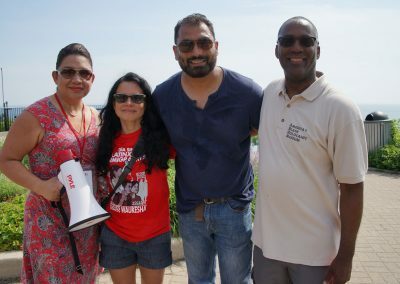 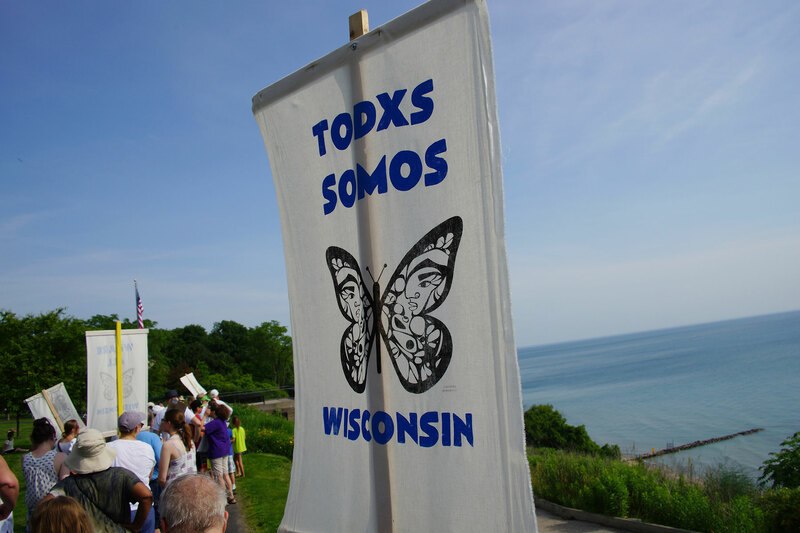 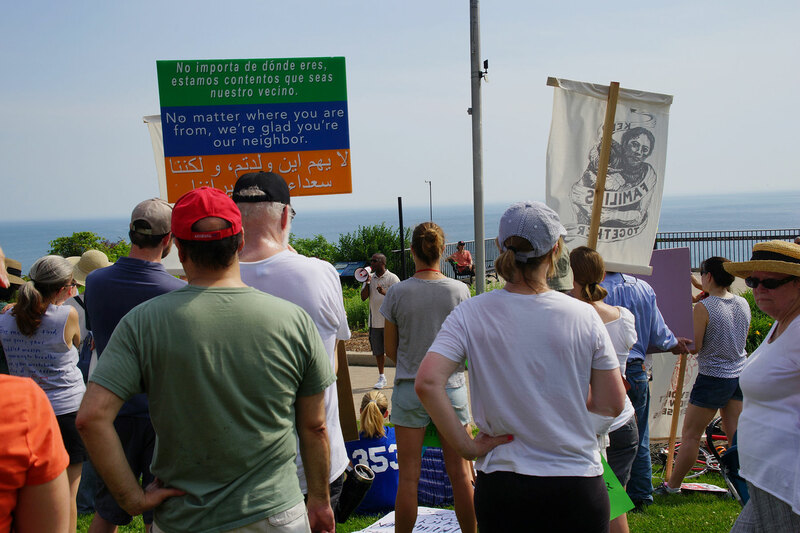 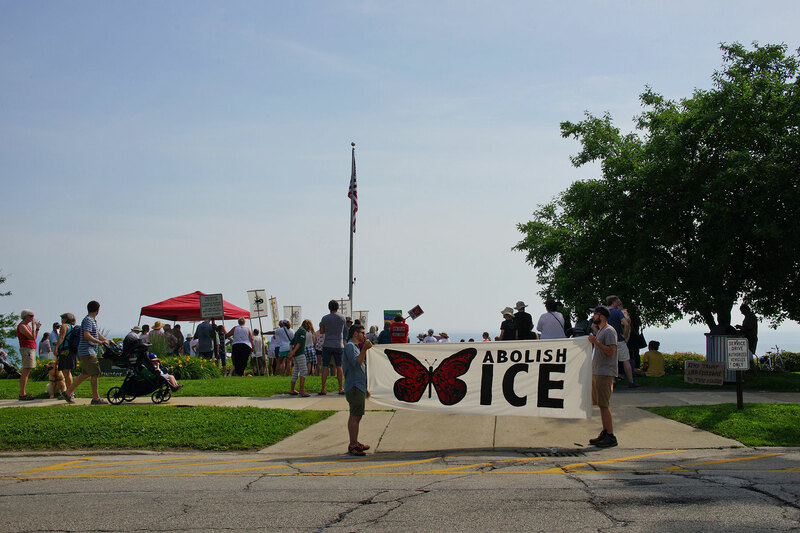 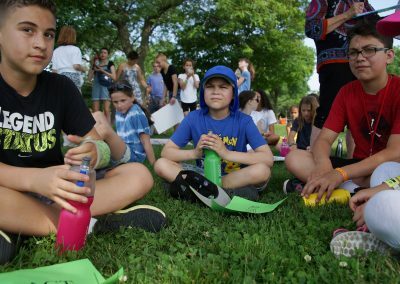 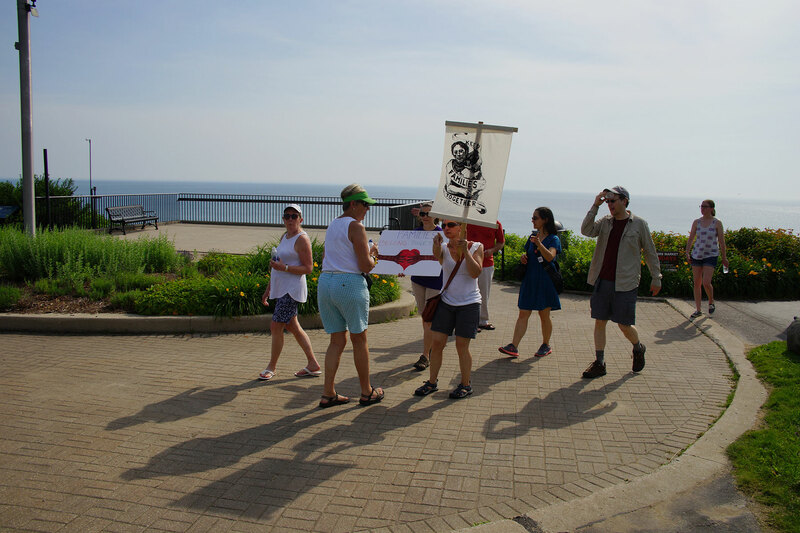 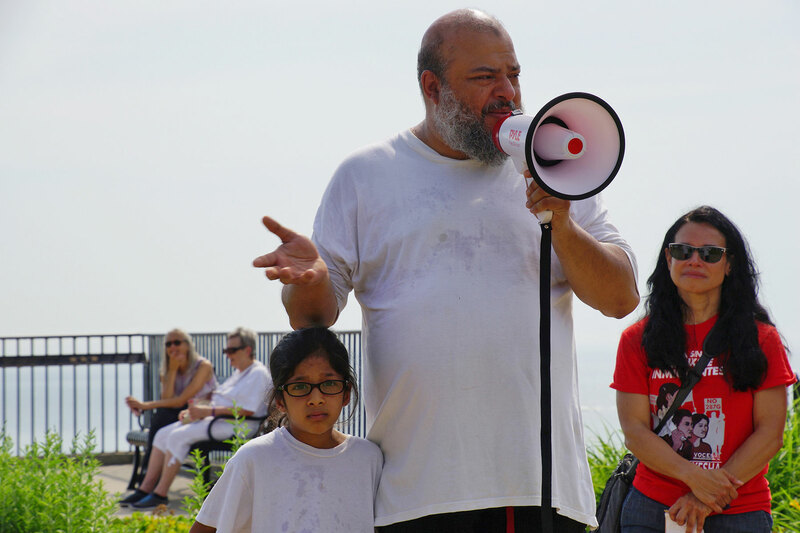 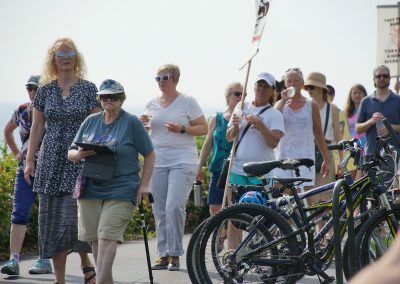 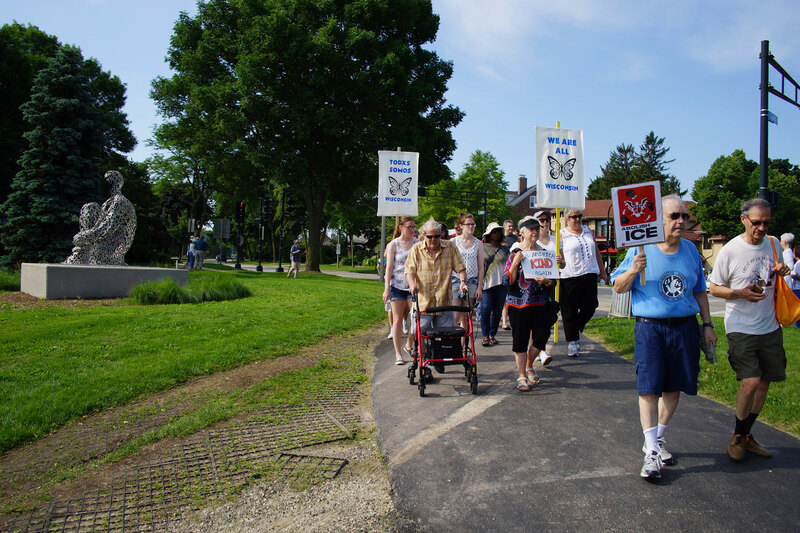 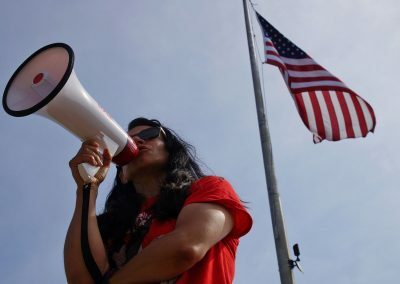 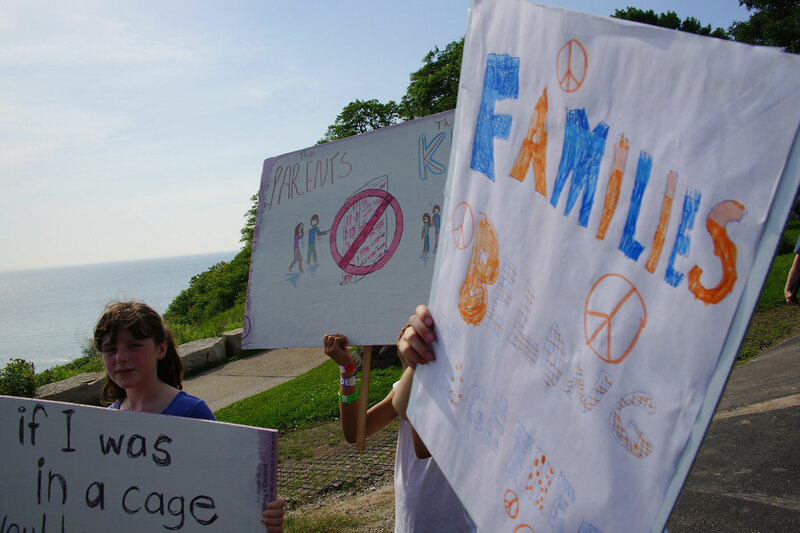 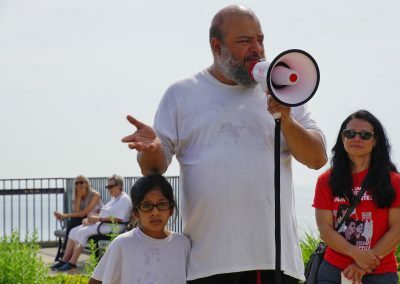 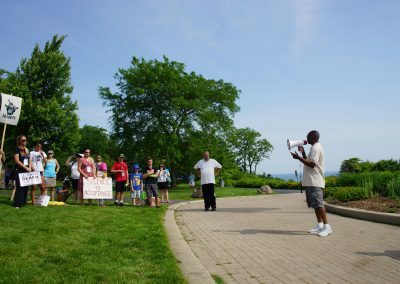 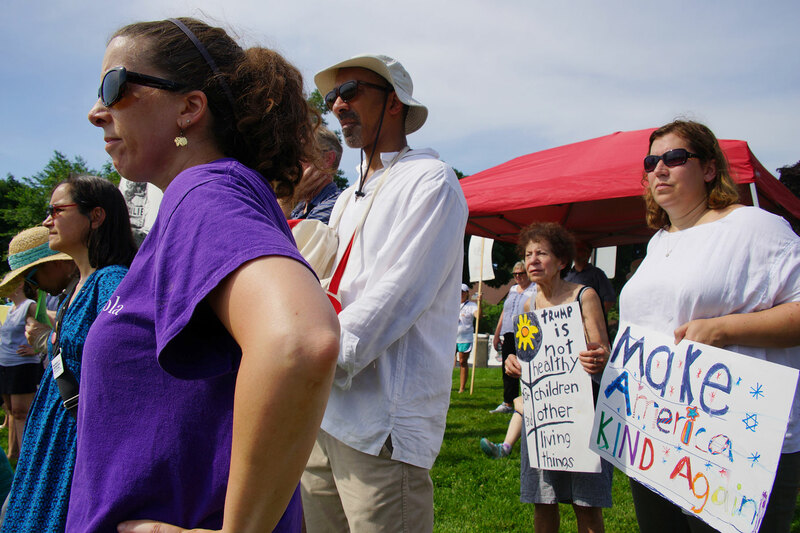 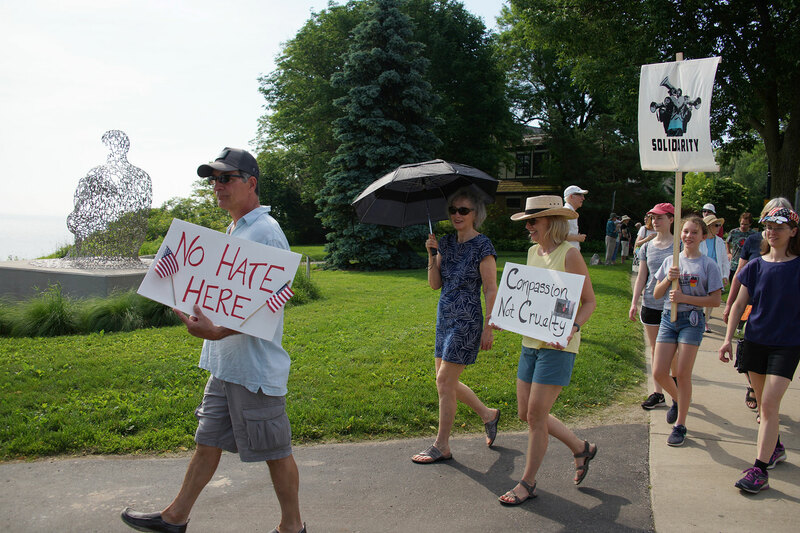 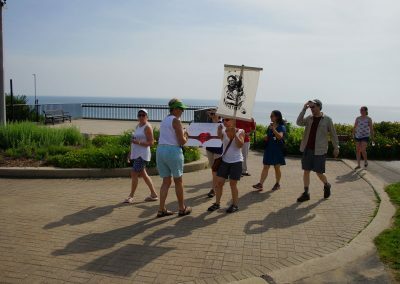 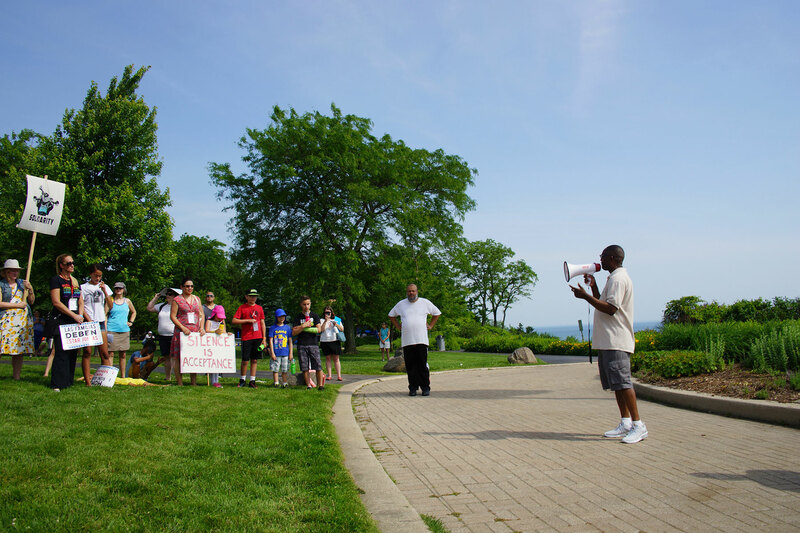 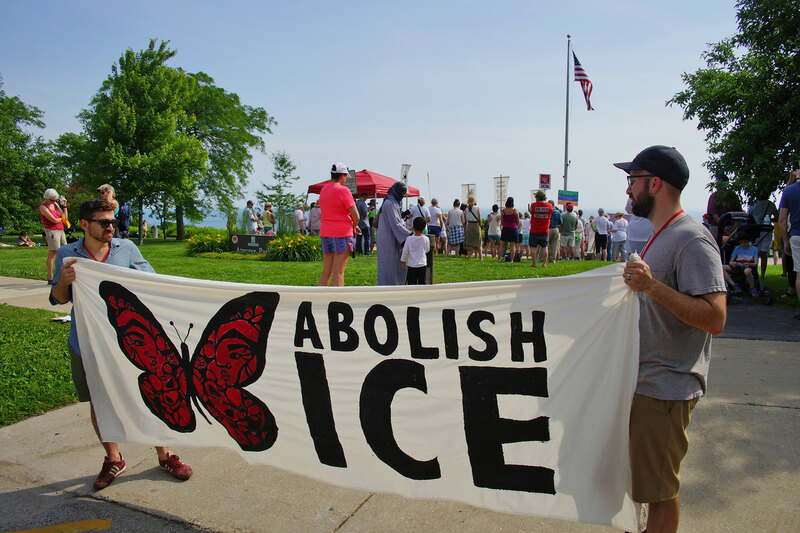 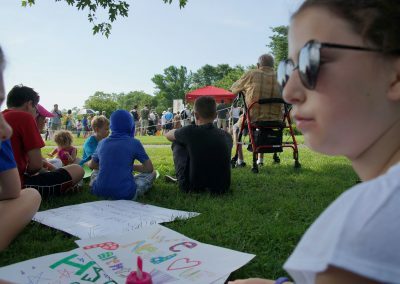 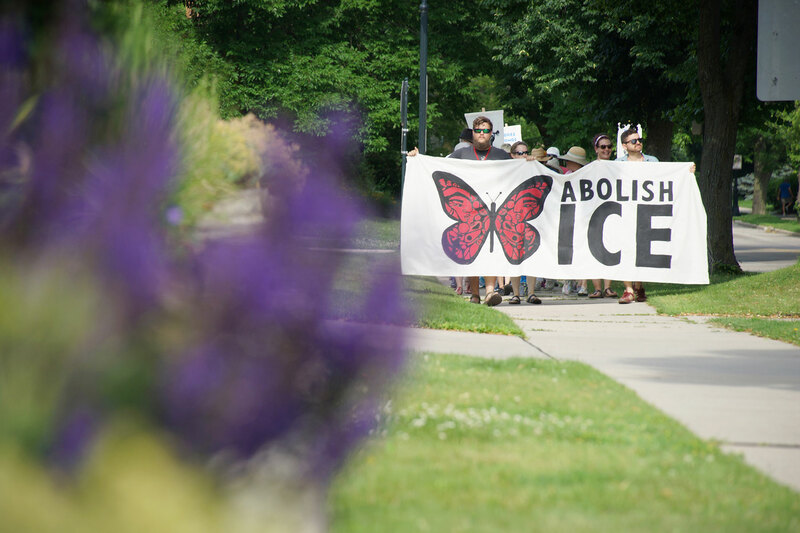 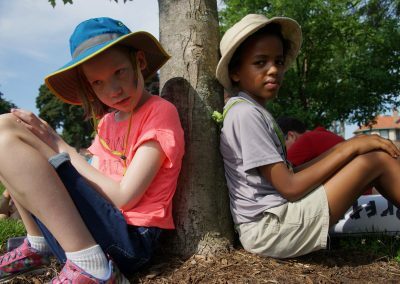 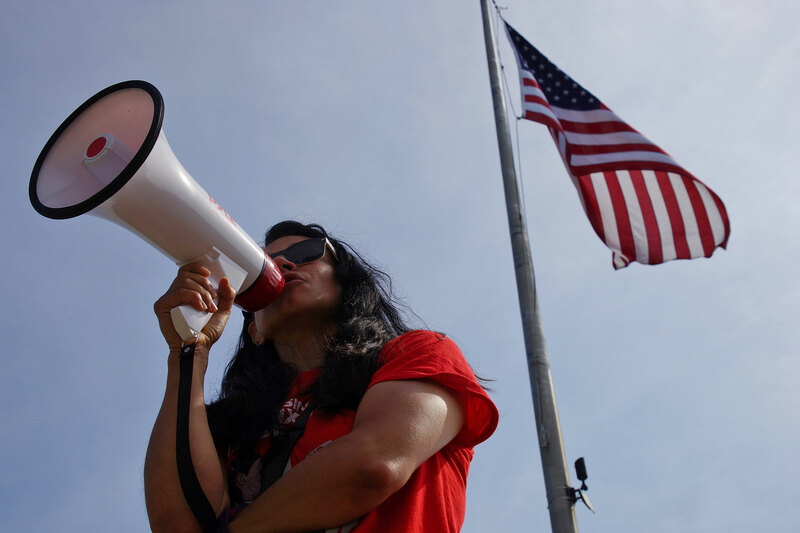 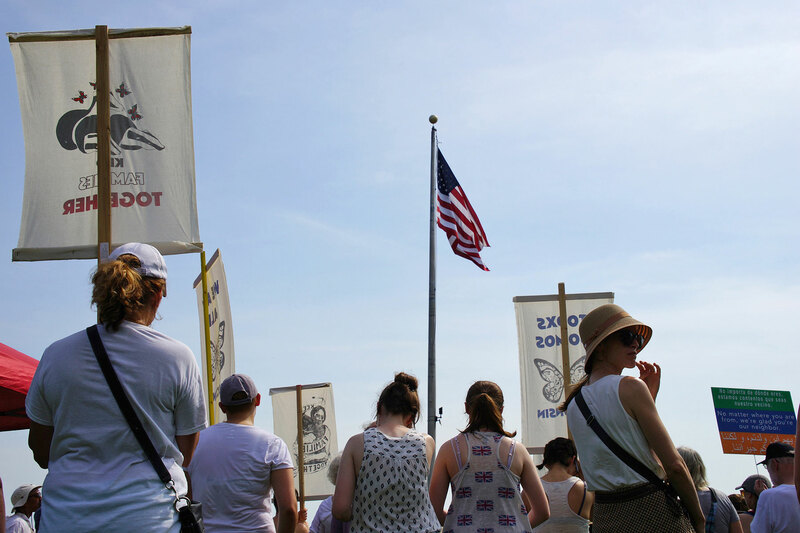 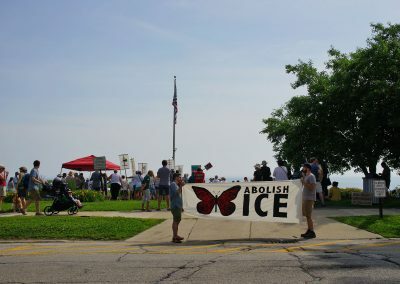 Several hundred participants, mostly families, marched in the blistering heat from the Shorewood Village hall to Lake Michigan’s Atwater Beach. 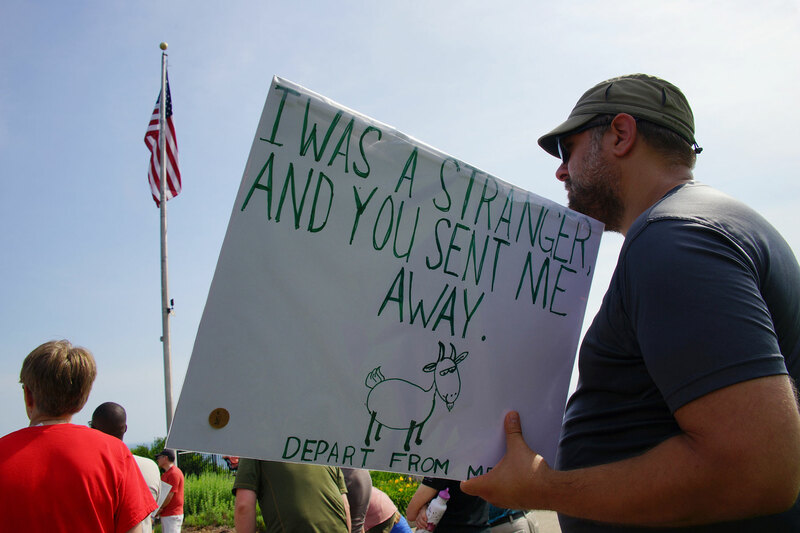 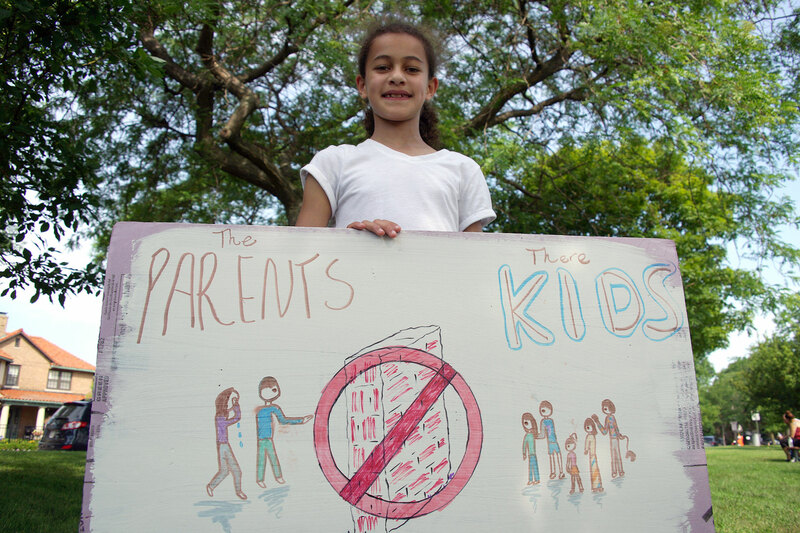 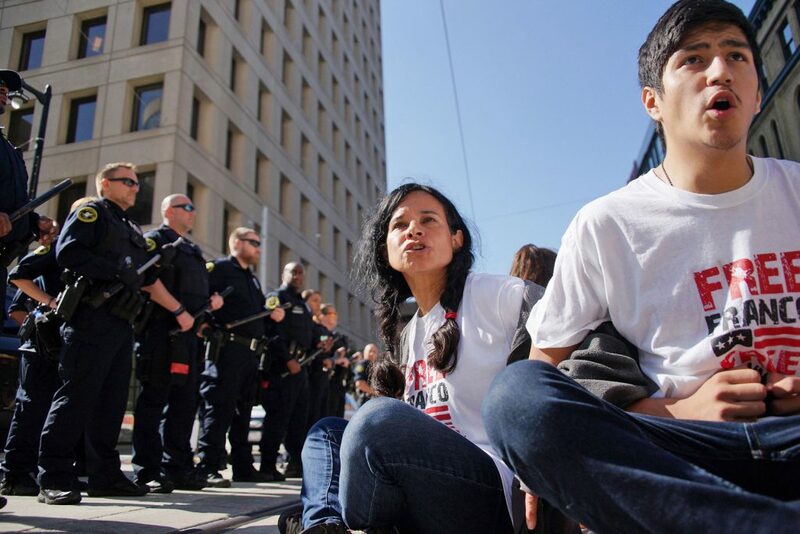 At the gathering, children were separated from their parents in a symbolic gesture that reflected the more than two thousand children who have been taken from their parents at the United States border with Mexico in recent months. 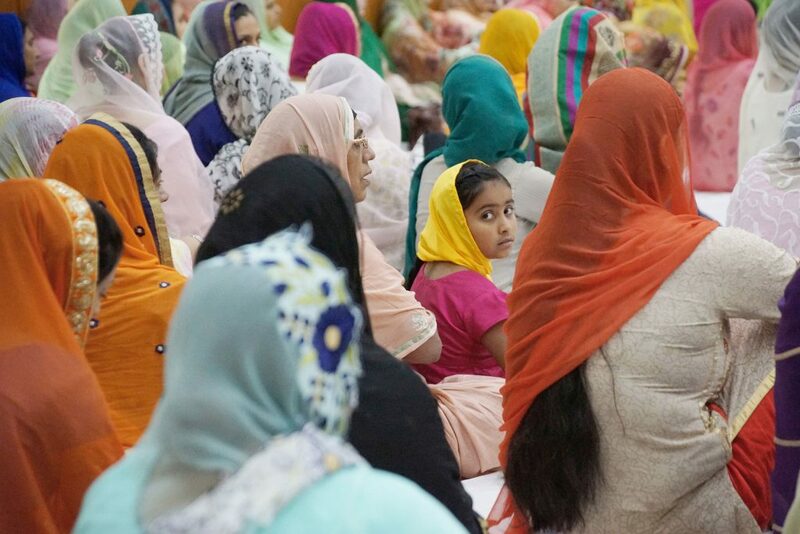 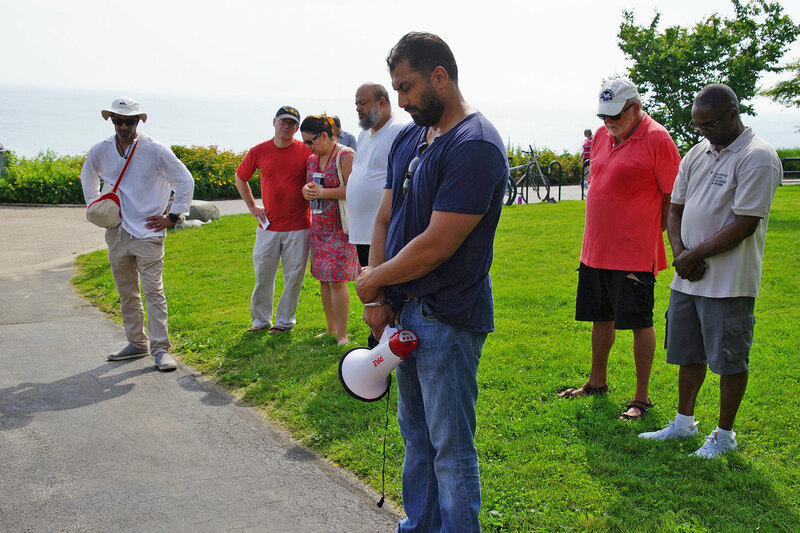 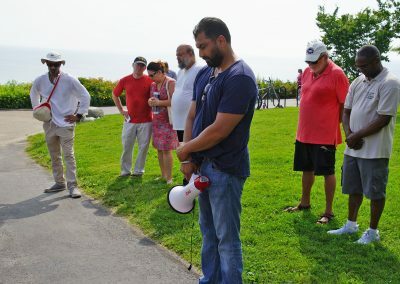 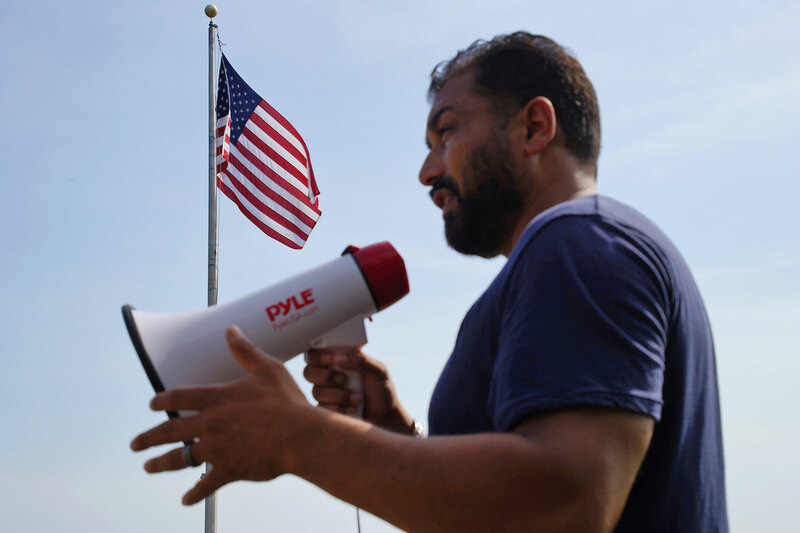 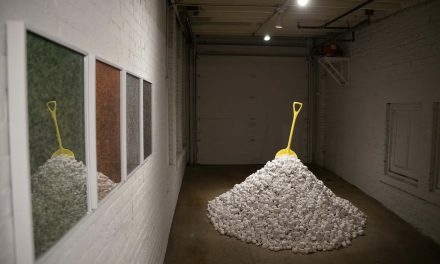 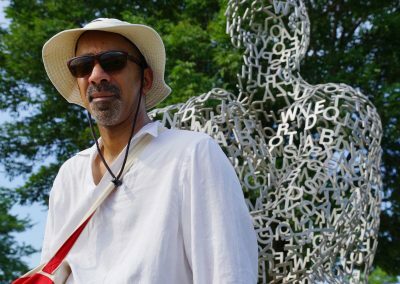 Pardeep Singh Kaleka, an editor and columnist with Milwaukee Independent, called for two minutes of silence and asked the parents to turn their backs to their children, in another act of symbolism that reflected the apathy and complicity of white Americans towards the issue. 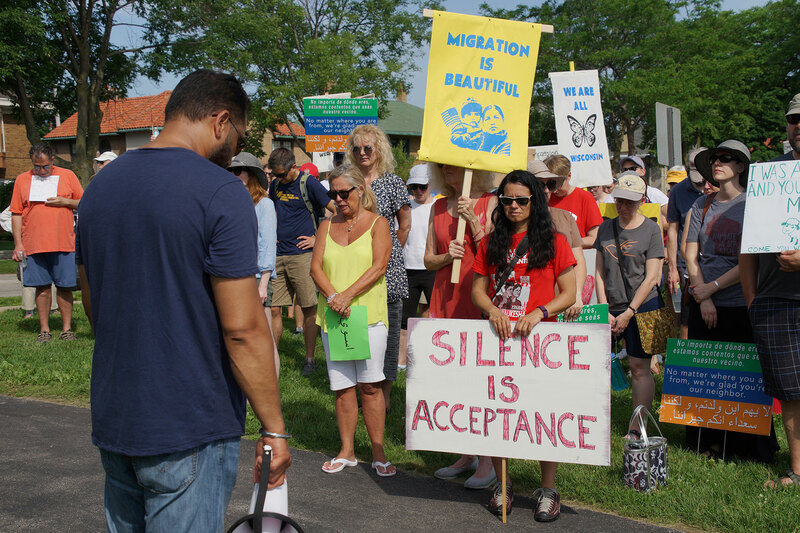 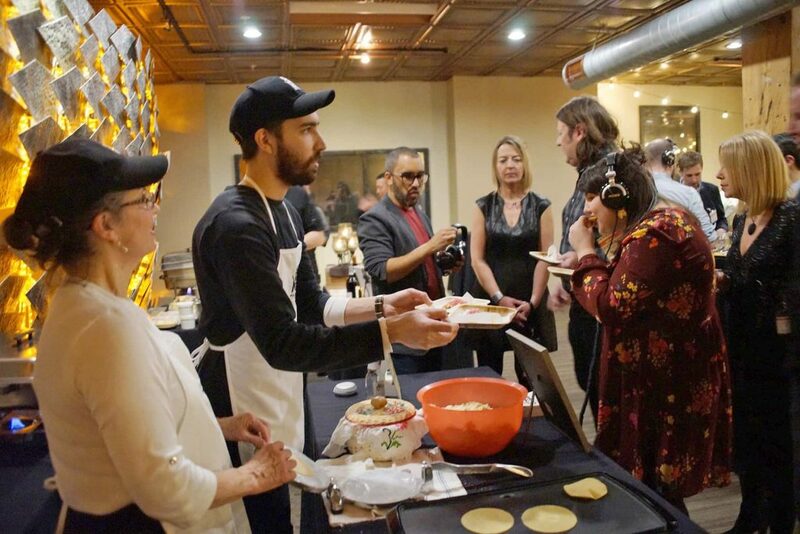 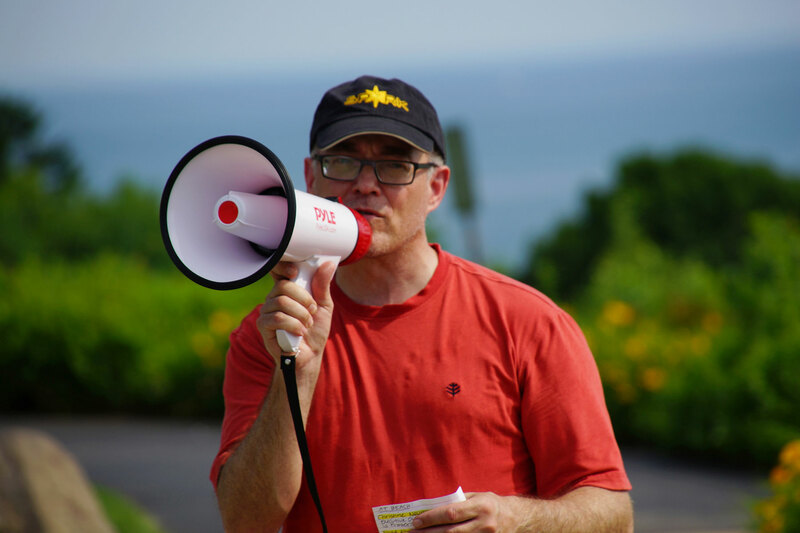 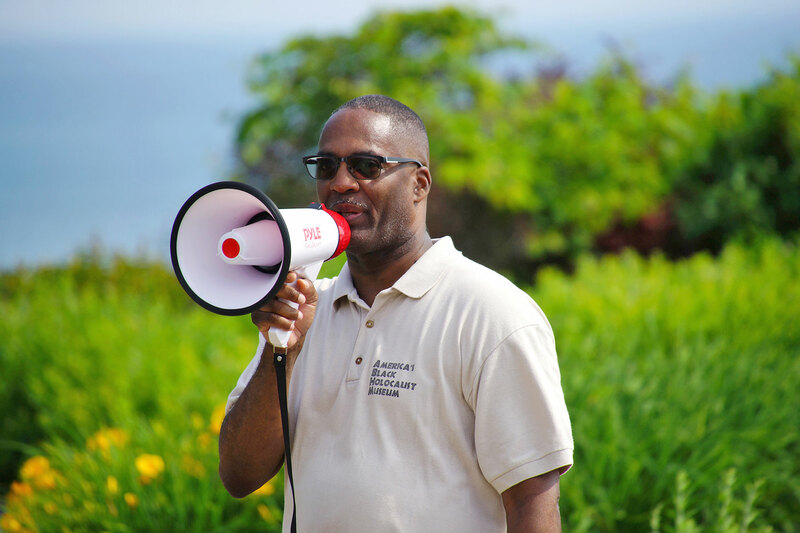 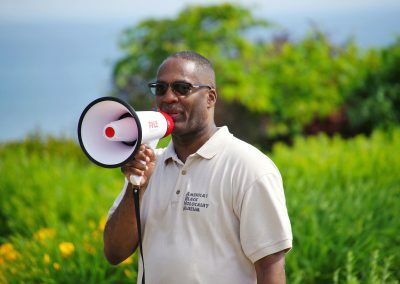 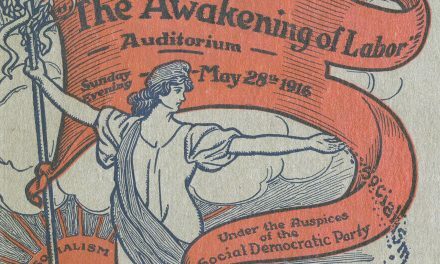 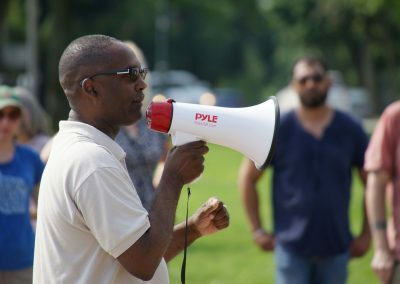 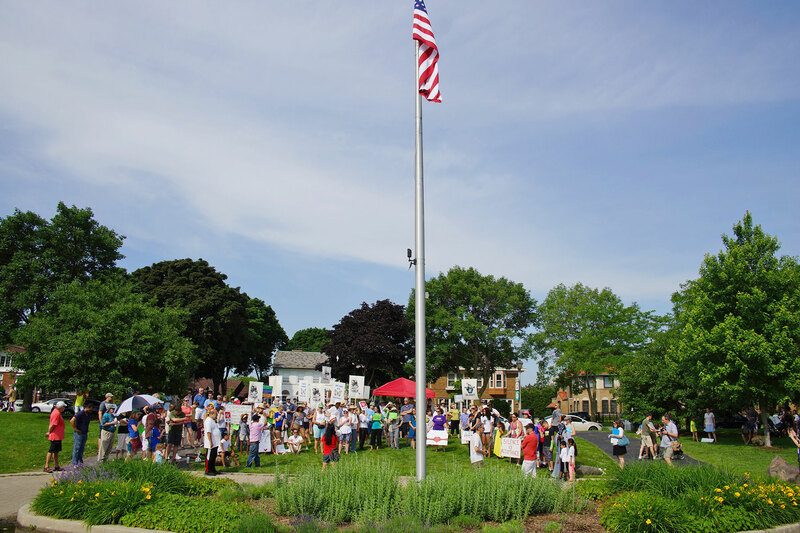 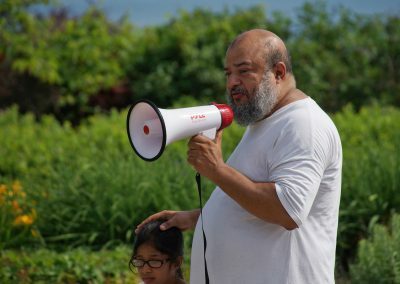 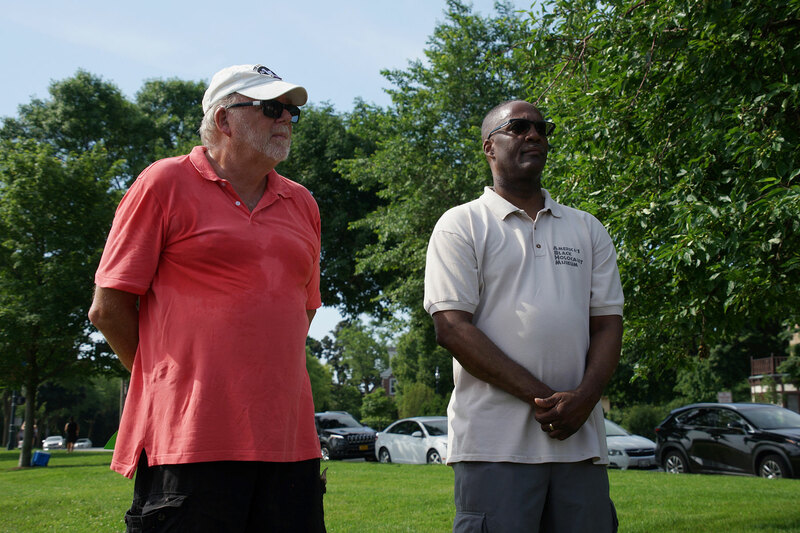 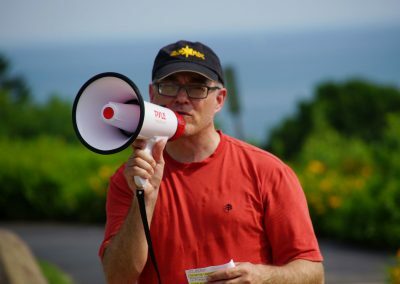 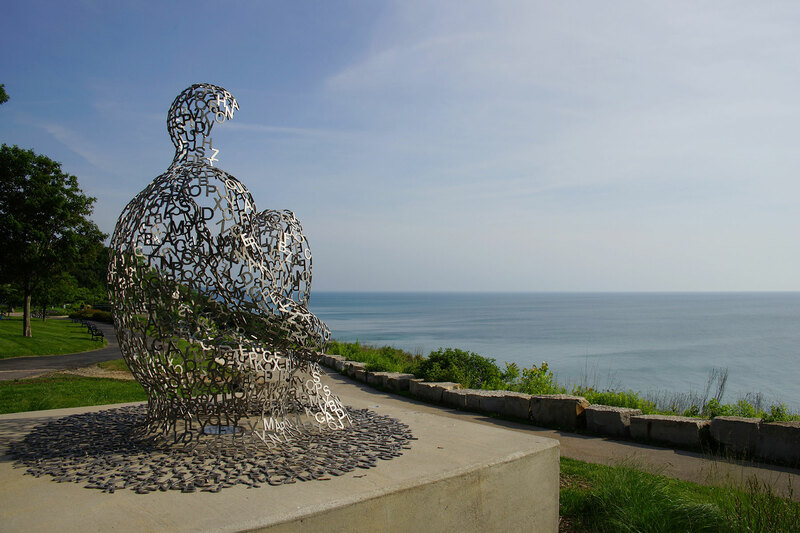 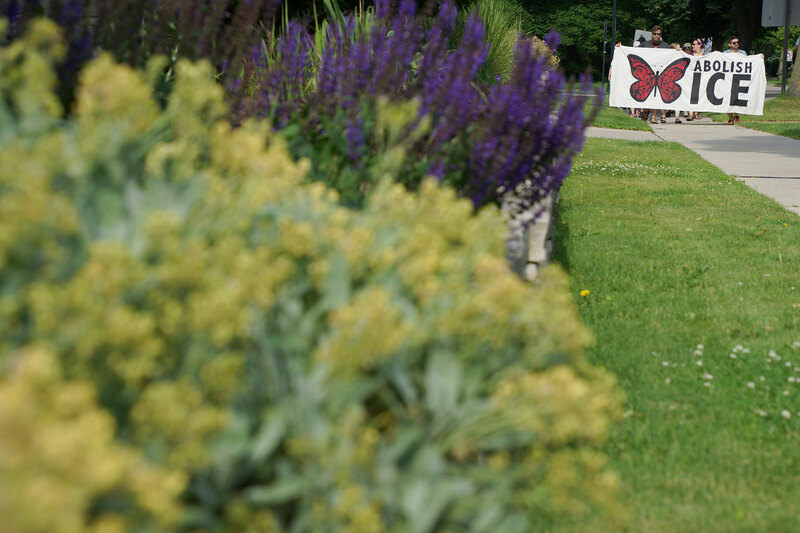 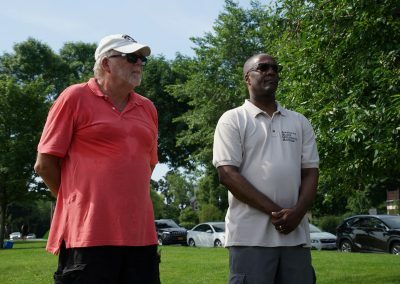 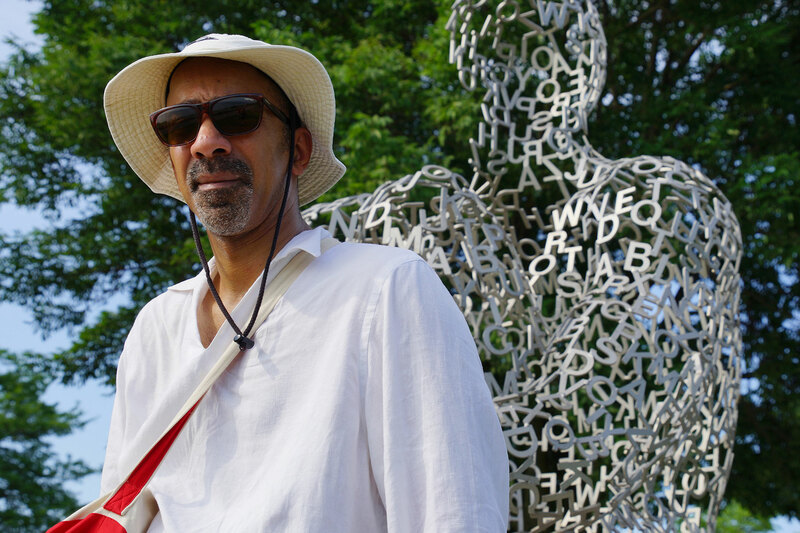 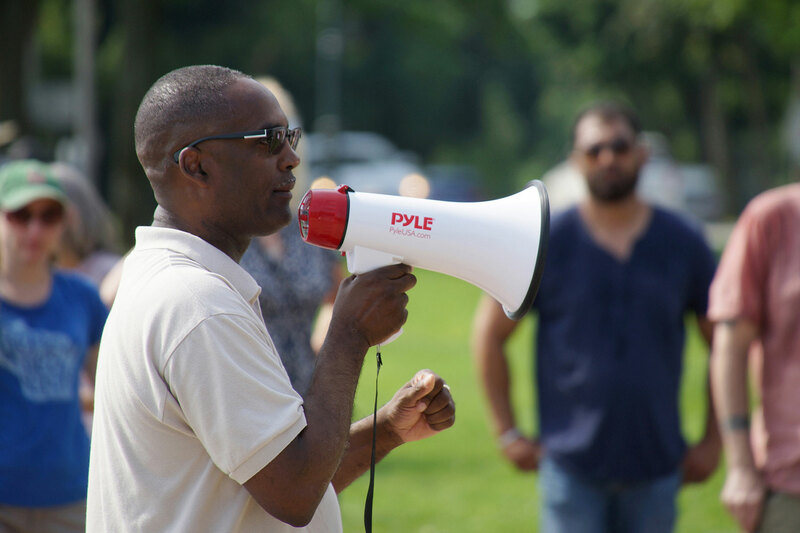 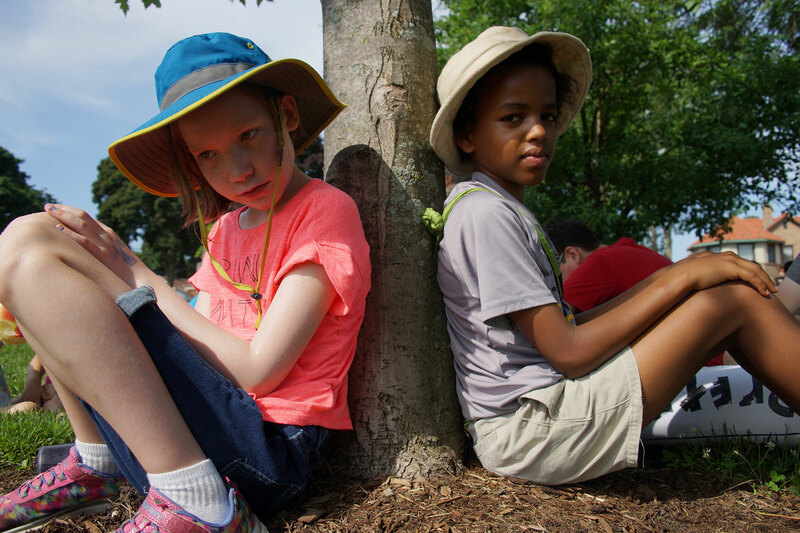 As a Shorewood resident and member of the village’s solidarity network, Ken Cole helped organize the public event, and was invited to share his thoughts in this essay. 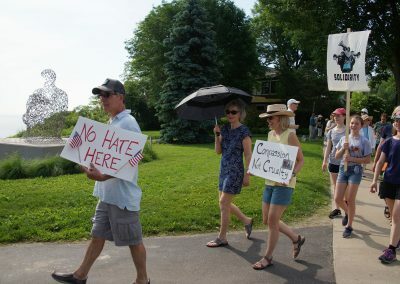 When learning about the death of Heather Heyer at the hands of a Neo-Nazi, or the internment of three year olds in the desert camps of Texas. 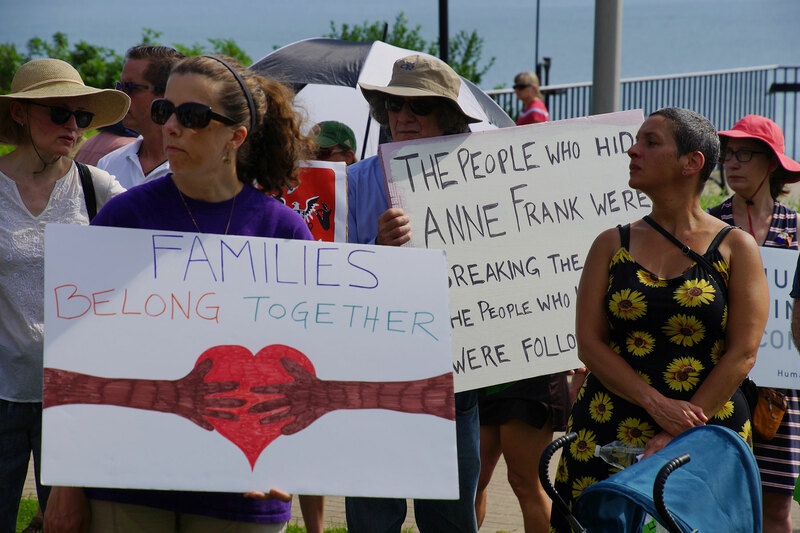 “What did you do?” assumes that their mother, father, aunt or uncle, did something to stop the spread of hatred and dehumanization. 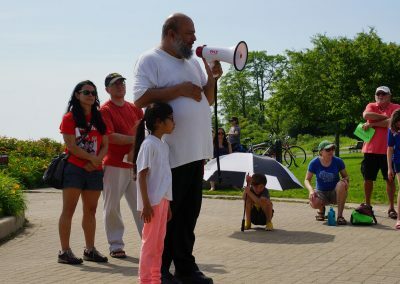 But ultimately there will be unspoken and restrained repudiation, from knowing that the answer the elders provide is hollow and lacks any sign of concern or action that directly countered the atrocities that grew exponentially after January 2017. 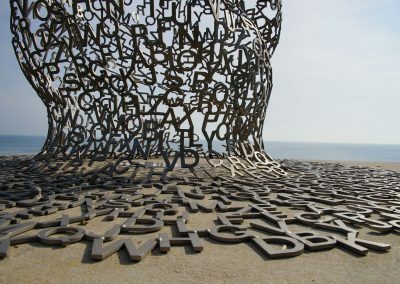 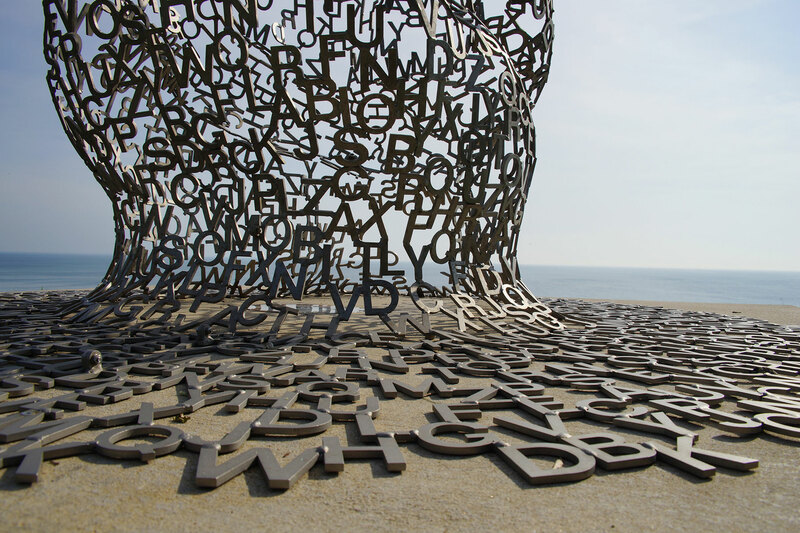 They will not ask, “how did you feel,” or “what did you think?” All that will matter is, what you did. 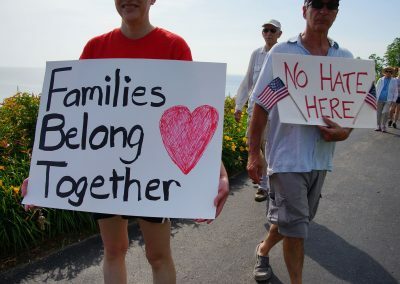 This would be asked by those Americans who ultimately choose to soul search over their role, should America descend into fascism, replete with white supremacy, xenophobia and financial collapse. 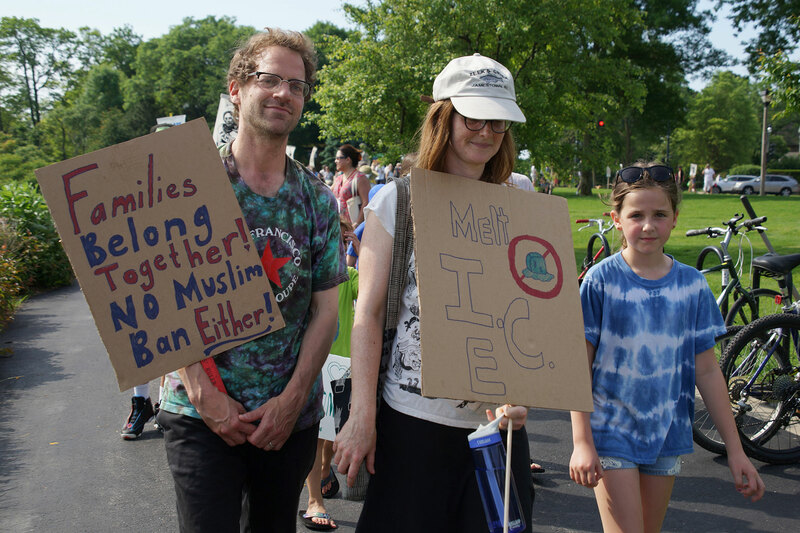 Time and time again they will stumble across the same answer. 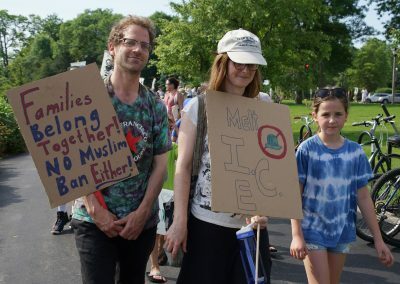 An answer that is brief but exposes the co-dependent relationship between a lack of action, and the license this administration gives them to continue their campaign of hatred and depriving people of positive human qualities. 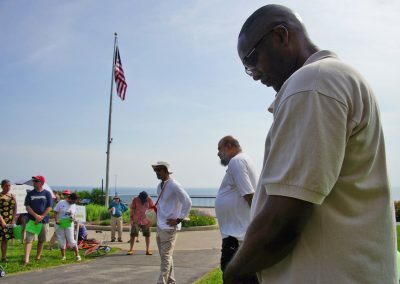 “What have I done” will not be asked by who the individual is, but who the person was before our country and its citizens changed. The effort would come from seeking counsel with the type of American people thought of themselves to be. 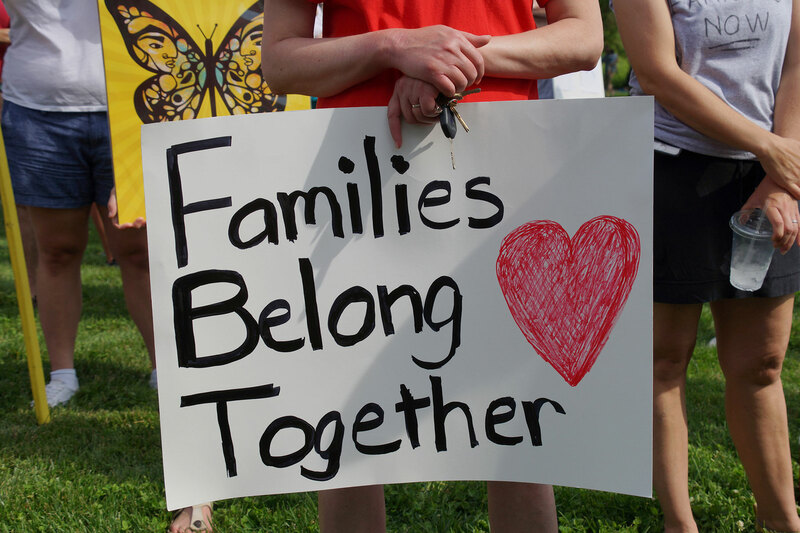 The one who could not allow a mother to have her child ripped from her arms, never to be reunited again. 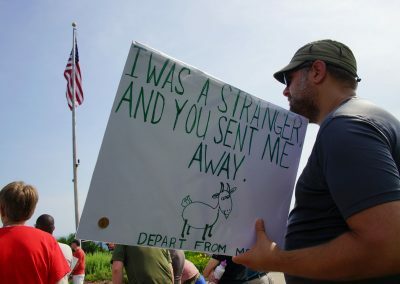 Or who stood up to the propaganda of hate as whole countries were disregarded as ‘shitholes.’ Or who protested the unraveling of the very tenets of our democracy that were tossed aside like a misspelled tweet. 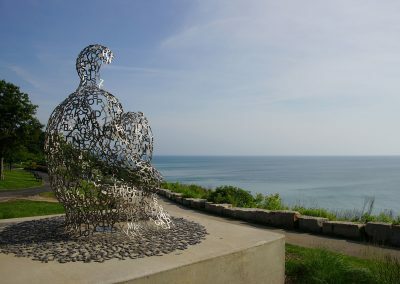 But in that question, “What have I done” will challenge a person’s self-perception, and the reality will be hard to swallow. 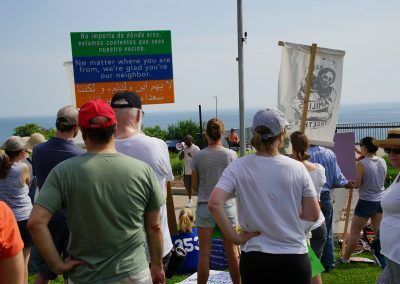 The gulf of inaction would make it clear who people thought they were, and the choices they made that confirmed which side they stood with. 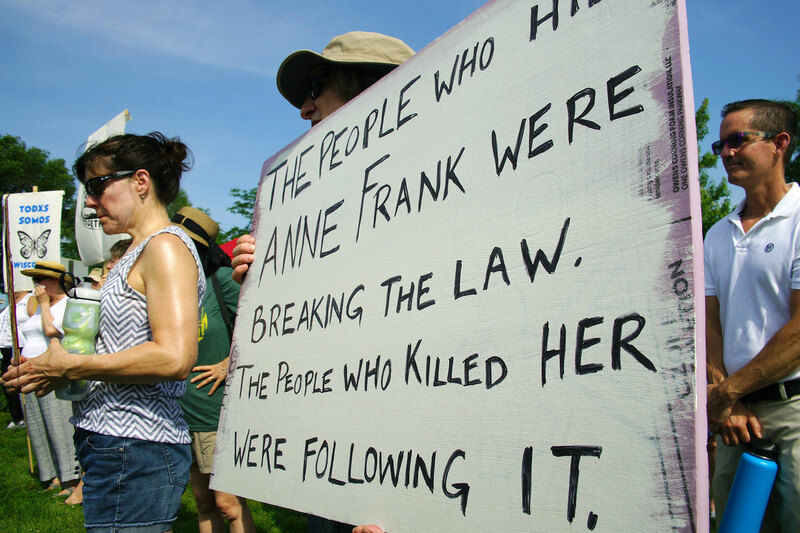 These two questions are being asked in America today, similar to how they were in Germany of the late 1940s as that nation came to terms with the atrocities of the holocaust their government orchestrated. 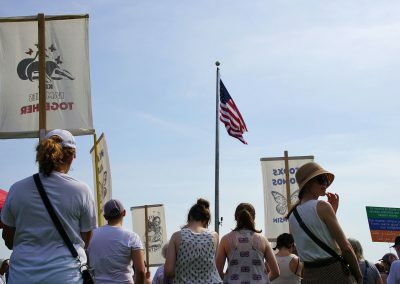 The historic precedent and mindful hindsight allows us to consider these questions, ahead of the further destruction of the norms that held our tenuous country together. 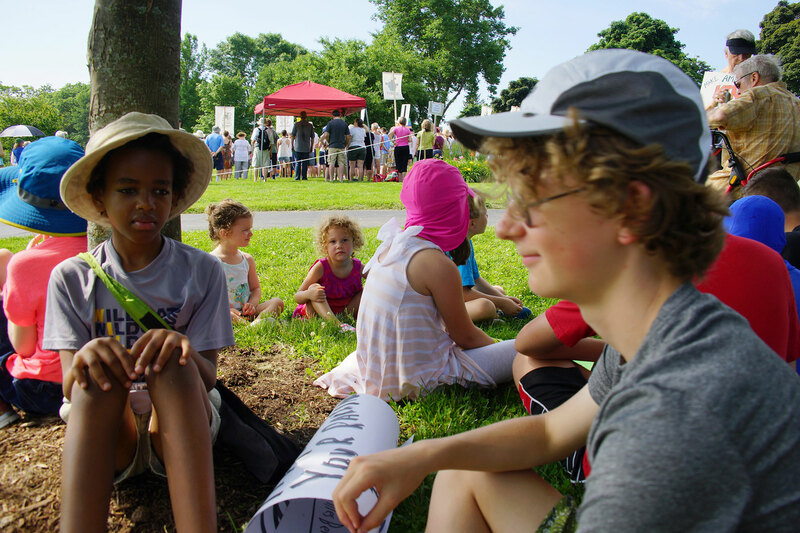 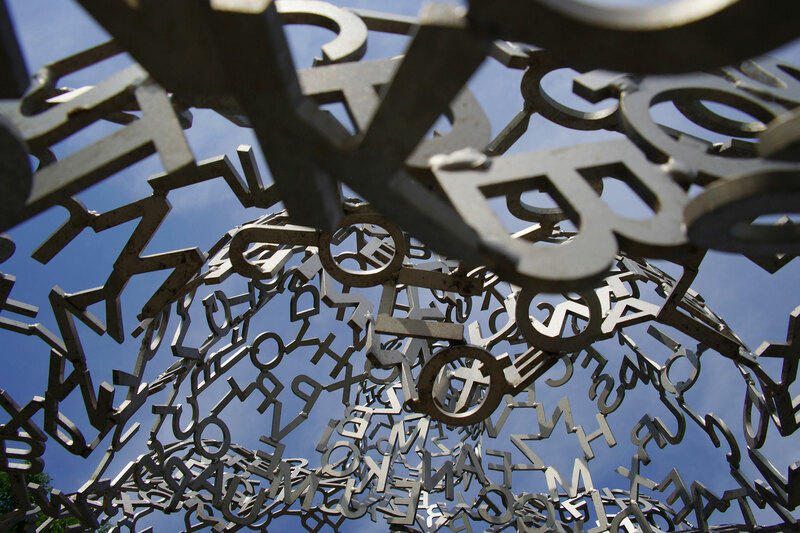 Asking the questions now means that people are better equipped to take action. 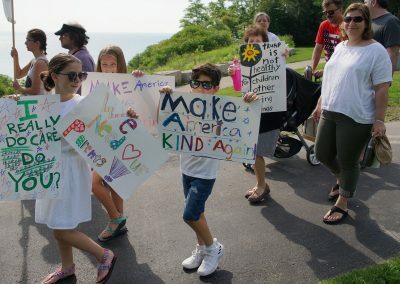 As we see that the checks and balances of our governmental bodies fail to either check or balance, there is increasing recognition that the average citizen has little interest to save our country’s democracy, and their apathy is the driving force that is determining the future of the nation. 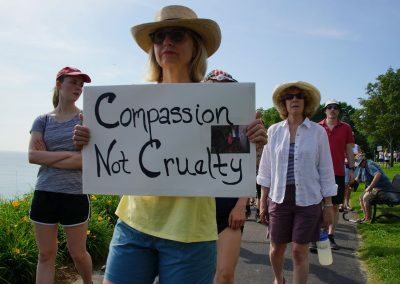 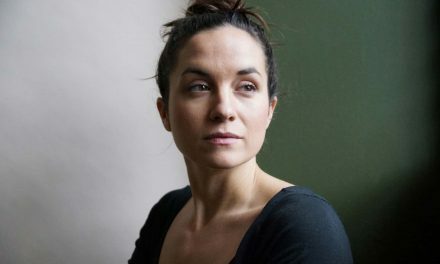 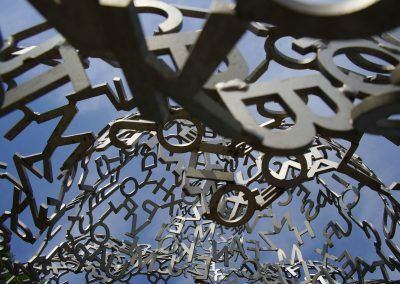 Whether inspired by the need to answer the questions of “What did you do,” or to avoid the searing reality of our own frail humanity when asking “what have I done,” asking either of them now is at least a step in the right direction. 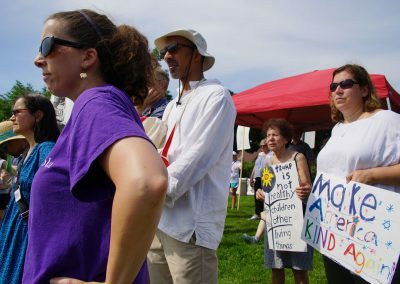 Small marches, protests, get out the vote efforts, all form a social collective that crosses racial, ethnic and religious lines. 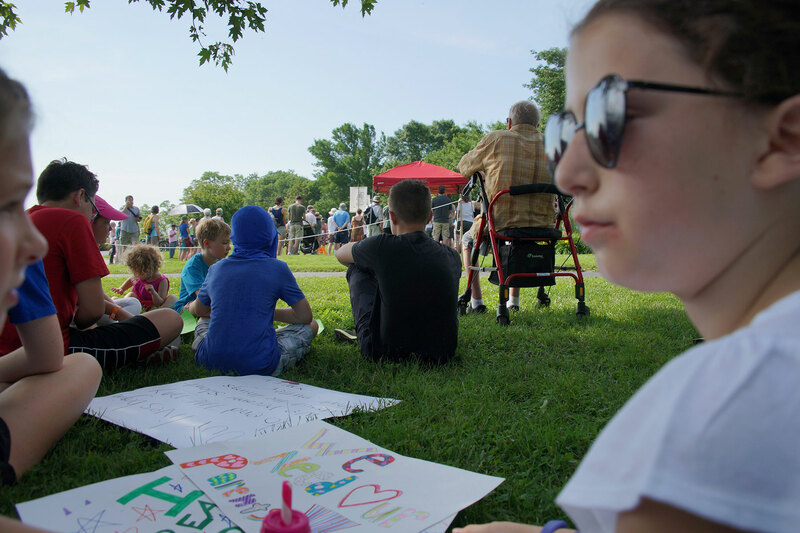 These events build a real time forum for people to recognize that they are not alone, and that our country is worth fighting for, and that they may be the very person to lead the fight.